The Clean Team has chosen the Princesses for you this week and Jen M has chosen her Queen! 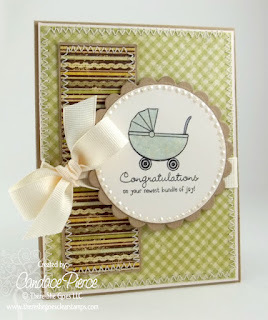 The muted colors of Candace's card have a wonderful homespun feel to them - perfect to welcome a new little bundle! The gingham patterned paper reminds me of a soft baby blanket. I love that she added some zig-zag stitching and little pearls around the circle. These details and the lovely bow give the card some wonderful texture. Congratulations Candace on being my pick for Queen of Clean! Don't forget to come on back tomorrow for a fun sketch from Lesley! Great choices....love them ALL! Congrats to everyone! Thank you Cindy for picking me as a Princess this week! What a wonderful way to start the day. Congrats to all of the winners, beautiful cards! Yay!! I'm a Princess!!! I think I needed that :) Thanks so much Tui, I love working with Freshly Made Sketches! To all the Clean Team, you all are very inspirational and I look forward to the next sketch :)Congrats to all the other Princesses too!!!! Thanks so much for the Perfect Princess honour :) Made my day!